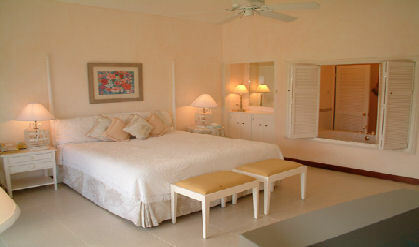 Located adjacent to the Great House, with views of the Caribbean Sea and golf course, are the one and two-bedroom air-conditioned Great House Villas. The Villa Suites are located just a minute's stroll from the Great House, terrace, restaurant and bar, shops, commissary and the massage parlor and beauty salon. They are also conveniently located close to the main infinity pool. The one bedroom Great House Villas are split level with entrance foyer, bedroom, bathroom and a small patio on the upper level. They are also equipped with a full kitchen and dining/living area on the ground floor, with a comfortably sized porch on lower level.